In the name of Allah, the Merciful, the Mercy-giving. Subhanallah! This undoubtedly is the Word of Almighty Allah! When we try to understand the meaning of the word “Qur’aan”, its richness tends to weave a tapestry in the canvas of one’s mind. The word “Qur’aan” comes from the Arabic root Qa ra’a which means ‘he read, he recited’. It also means ‘the reading, the recitation’. The word is used in infinitive verbal form – and, quite obviously verb is nothing but action! The relationship between reading and the Book is quite interesting. Let us understand with the help of one example. The scripture of Judaism and Christianity is called the ‘Bible’ which means ‘Book’. The scripture of Islam is called the ‘Qur’an’ which means the ‘Reading’. Book is a product. Reading is a process. The utility of a book can be realized only when somebody reads it. Otherwise it will be a dead thing on a shelf. It comes to life or animation only when its meaning begin to work in readers’ mind. The book is a non-entity, meaningless, lifeless. Our Book has a name which lays emphasis on the process. The book comes to life only because it is read. What is to be read is the Qur’an! So in that way it establishes relationship with the Book. 2. Allah is our Guide. Through His Book He has guided us. People have been put on a wrong track by interpolation in the scriptures. To set matters aright, to guide people in a proper manner, Allah felt it necessary to send His last and final Messenger, Prophet Muhammad, peace be upon him, with a Book to be read for the final and ultimate occasion. Al Qur’an, therefore, is not only the inimitable Word of Allah but it is also a milestone marking the completion of Allah’s message to mankind. 3. Al Qur’an is Allah’s Teaching primarily to Prophet Muhammad (Peace Be Upon Him) and generally to the people of the world. Reading and Explaining are a part of Divine Teaching. The Qur’an is not only Almighty Allah’s Reading and Revelation to Prophet Muhammad (peace be upon him) through his chosen angel Jibreel, it is also His crystal clear Explanation. So the Glorious Qur’an is the Creator’s Tibyaan – Crystal Clear Explanation. 5. Al Qur’an is Al Burhan, Allah’s Credential. It is an irrefutable proof that the author of this Book is none other than the Creator and the Sustainer of the seen and the unseen – Almighty Allah. 6. Al Qur’an is Al Furqan, the Criterion that Distinguishes between Right and Wrong, Truth and Falsehood. The Qur’an filters the wheat from the chaff! 7. True Believers in Qur’an read the Qur’an as it should be read. * The Qur’an must be read properly according to the set rules of recitation, and not according to one’s whims and fancies. * Its words and verses have to be pronounced correctly with proper articulation. 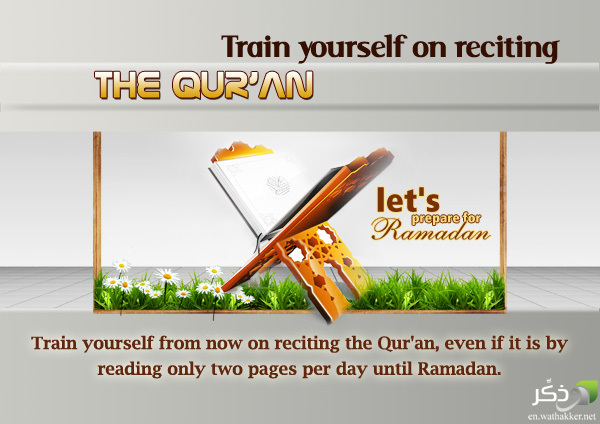 It is a duty upon every Muslim to learn the art of Qur’anic Recitation, the Tajweed. * It has to be read or recited in a slow and measured rhythm. The Prophet Muhammad (peace be upon him) said, “He who does not hymn the Qur’an, do not belong to us”. The glorious Messenger of Allah also said, “Beautify the Qur’an with your voices”. * The Qur’an is not an ordinary book. It has to be read with due respect and reverence as it is a Book authored by Almighty Allah. Cleanliness of one’s body, mind and place are necessary pre-requisites for reading the Book of Allah. It cannot be simply read as someone reads a novel sitting with legs crossed in a library! 8. The Qur’an is not just for Reading. It is for understanding and putting it into practice. Many Muslims read the Qur’an day in and day out. But how many of them understand the Qur’an? The simple excuse some ‘smart ones’ give is that they read the Qur’an for Thawab (Reward) and Barakah (Blessings). There is no denying the fact that reading the Qur’an brings a great amount of reward and infinite blessings. But the question is DID ALLAH SENT DOWN THE QUR’AN MERELY FOR THE PURPOSE OF GRANTING REWARD TO ITS READERS? Some non-Muslims, the unbelievers, also read the Qur’an! Will they be rewarded for that? Will they go to Jannah under the mere pretext of reading the Qur’an? The fact that Allah sent down the Qur’an in Arabic language was to make things clear and understandable to Prophet Muhammad (Peace be upon him). If the Qur’an had been merely for reading, then Allah would not have sent the Qur’an in Arabic! The Qur’an was revealed in piecemeal in varying lengths so that Prophet Muhammad (peace be upon him) and his followers would understand the Qur’an very clearly and the faith of the growing Ummah would take a firm foothold. If the Qur’an had been merely for reading, Allah would not have taken twenty-three years to complete the revelation of the Qur’an! He could have simply bundled a book and couriered through Jibreel to Prophet Muhammad (peace be upon him)! 1) Learning the language of the Qur’an is imperative upon Muslims. A Muslim must try to learn Arabic language. We struggle and strive hard to do many things in life to achieve our goals, right? Why don’t we learn a language that is so dear to our hearts? Learning Arabic must be given priority. We must also know that learning the language of the Qur’an is worship in itself. 2) It is true that the Qur’an is in Arabic and that no amount of translation, however great, can take the place of Arabic. But with help of the interpretation of its meanings either in English or in one’s own mother tongue, the Qur’an can be understood at least to the extent of knowing what has to be done in practical life. Can’t we do even this? So, is there any who can apply his/her mind to what is being said in the Qur’an? Allah has made things easy for us. Who are we to make it difficult? Some Muslim parents have made Arabic language so sacred that it has caused a sort of fear among the children that the language is Divine and cannot be understood by ordinary people! When Allah, the Revealer Himself, says that the Qur’an is easy for us to remember who, then, are we to say that Qur’an is difficult and that it cannot be understood? The disease lies in the mind and we need to change this mind-set. 10. The Qur’an is Al Huda, the Guidance. We Muslims must translate the Qur’anic teachings by practically following them in our lives. This is the principal purpose of the Qur’an. Otherwise the whole exercise of reading and understanding would turn out to be a mere academic pursuit! Not only this, the Qur’an would speak against us in the Day of Judgement. And the Prophet (peace be upon him) would have reason to complain in the Day of Judgement that his Ummah did desert and abandon the Qur’an! 11. Reading, Understanding and Living by the Qur’an is a SURE WAY to success and salvation in the Aakhirah. The Qur’an will become our spokesman. It will recommend our case, our salvation to Almighty Allah. Prophet Muhammad (peace be upon him) said, “Read the Qur’an, for it will speak in favour of its people on the Day of Judgement” . 11. Those of us who are, by the grace of Allah, able to read the Qur’an should take all efforts to teach it to others. The beloved Prophet Muhammad (peace be upon him) said, “The best among you is the one who learns the Qur’an and teaches it”. 12. Those who try to become efficient in reading, understanding and applying the teachings of the Qur’an are honoured with a very special status. Prophet Muhammad (peace be upon him) said, “The experts in the Qur’an are among the noble Angels”. May Allah give us the Tawfeeq to read, understand, teach and live by the Qur’an. Aameen. Ramadhan is the month of the Quran. Jazakallah for this beautiful article. It will help me connect with Allah’s book like never before. I intend to read the full translation of the quran to understand what Allah SWT said to his messenger for all of mankind. May Allah SWT reward you for your work.